The 2018 Dan Campbell Junior Golf Academy!!! The academy is now offering Trackman 4 lessons to students to take their game to the next level! Congratulations to Catcus Shadows, the 2017 Highschool State Champions! Great job Taylor and Kylee!!! The Academy is a safe, fun environment that combines friends, teamwork, individual goals and hard work for a unique one of a kind experience for all juniors! The DCJGA working out with Coach Mindi! DCGA Student Kevin Stadler watches his tee shot at the Alstom Open de France en route to a second place finish! DCGA Professional Student Kevin Stadler and Coach Dan Campbell preparing for the Master's at Augusta National! Kevin Stadler and the Dan Campbell Golf Academy have officially claimed their first PGA Tour Win at the 2014 Waste Management Phoenix Open! Future Elite Program (FEP) Members posing with the winner's check from the 2014 Waste Management Phoenix Open! Utilizing our state-of-the art launch monitor! The Dan Campbell Golf Academy specializes in Fixed Axis Swing Training (FIXST). FIXST is a model centered around swinging the golf club on plane, allowing players to become rotational or linear players. We believe in a golf swing that is efficient and repeatable for golfers of all ages and skill levels. Based on sound principles of geometry, physics and kinesiology, golf swings that allow for minimal compensations can be created. With the FIXST method, players will achieve simpler, more natural and repetitive swings that will help them reach their goals. 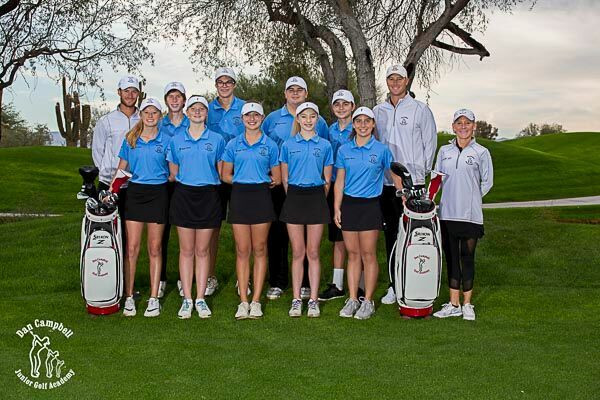 The Junior Elite Program is a comprehensive year-round program that encompasses all areas of the game, including full swing, pitching, bunker play, putting, course management and tournament preparation. Meeting with students two to three times a week provides opportunities for constant feedback and an ample amount of time for the students to improve their games. The program provides the top juniors in the area a place to call home—a place to practice with their peers and learn from one another. Click the Logo for Recent Videos!